Saffron, the dehydrated red stigmas of the flower of the plant Crocus sativus L., comprises the most expensive spice in the world. It is mainly used as a spice highly valued for its coloring power, bitter taste and unique aroma attributed primarily to Crocins, Picrocrocin and Safranal, respectively. Apart from its known applications in the food industry, a number of pharmacological actions have been assigned to saffron and its constituents. Expansion of the use of natural products in the prevention of chronic diseases or cancer as well as the interest in functional foods is expected to attract the attention of consumers to include saffron in everyday diet. Only authentic high quality Saffron exerts beneficial health effects. Saffron is comprised of the dehydrated red stigmas of the flower of the plant Crocus sativus L., a sterile triploid that belongs to the subfamily Crocoideae of the Iridaceae family. Saffron is the most expensive spice in the world, highly valued in different cuisines for its distinctive color, exceptional taste and unique aroma. The compounds that elicit yellow color hues are certain highly water-soluble apocarotenoids, the sugar esters of Crocetin, selectively named as Crocins. The trans-crocetin (di-β-d-gentiobiosyl) ester (trans-4-GG), commonly referred as crocin, is the most abundant member. The gustatory traits of the spice are given by the monoterpene glucoside, picrocrocin (bitterness) and certain volatiles, Safranal. Recently, light was shed on the biosynthetic pathway of these apocarotenoids through transcriptome sequencing. 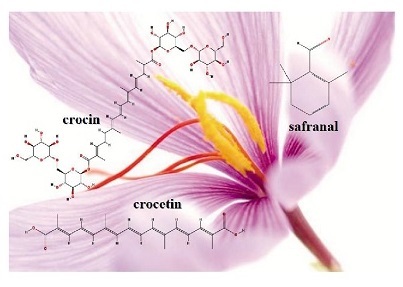 The precursor of saffron apocarotenoids is considered to be zeaxanthin that through successive cleavages give rise to the formation of crocetin and 3-OH-ββ-cyclocitral, which are then glucosylated to yield crocins and picrocrocin, respectively. These apocarotenoids accumulate throughout the development of stigmas, reach a maximum concentration at a fully developed stage and decrease thereafter, a fact that justifies traditional collection practices. Crocins and picrocrocin account for nearly 50 % (w/w) in dried stigmas. The moisture content of the latter is much lower and ranges between 9-12 %. Safranal is mainly formed during processing and storage and represents ca. 70% of the essential oil of the spice. Culinary herbs and spices have been traditionally used not only as flavor enhancers and food preservatives but also as folk medicines. Concerning Saffron, its use as a spice or textile dye dates back to early antiquity era whereas in traditional Indian, Chinese and European medieval medicines its extracts and tinctures are reported as antispasmodic, eupeptic, gingival sedative, carminative, diaphoteric, expectorant, stimulant, stomachic, aphrodisiac and emmenagogue. Today, there is a growing body of evidence from epidemiological studies that saffron apocarotenoids may present multiple biological actions including anticancer, anti-inflammatory, antimicrobial and antioxidant. A search in the Scopus database using as keywords “Saffron” and “Biological” shows that the relevant scientific articles published the last five years (n =53) are almost two fold more than those published between 2005 and 2010. The results of these studies provide strong evidence for the effectiveness of either individual apocarotenoids (Crocetin, Crocins or Safranal) or saffron extracts against various diseases. The most important health benefits concern activity against several types of cancer, gastric disorders, cardiovascular diseases, Alzheimer disease, and mild to moderate depression. Administration of saffron has been also found to ameliorate the side effects of conventional treatments e.g. sexual dysfunction by antidepressant drugs. Saffron is likely safe for most individuals when used at levels commonly found in diet. In all the preclinical and clinical studies so far, saffron has been administered orally or intraperitoneally. The common effective doses in clinical trials (30–50 mg/day) were much lower than the LD50 of saffron. The latter depends on the form of intervention and can range from around 1.5 g/kg (after injection in mice) to >5 g/kg (after human consumption) indicating a high safety margin for the exploitation of saffron in pharmaceutical preparations. Isolated constituents are also considered safe; a dose of 20 mg trans-4-GG/day over one month (in tablets) was found non-toxic for human consumption and Safranal was non-toxic for both mice and rats after oral administration. It should be stressed as a general remark that although intravenously injected extracts or compounds are considered fully bioavailable to exert any function in vivo, this is not the case for orally administered substances. As far as saffron bioactive ingredients are concerned, the data regarding their absorption profile are limited. Independent researchers have shown that Crocins, although highly bioaccessible are most likely hydrolyzed in the gastrointestinal tract to Crocetin, which is then absorbed as such or as glucuronide conjugates. Crocetin is reported to slowly penetrate the blood brain barrier to reach the central nervous system. The physiological disorders that can be alleviated after the treatment with saffron, crocins, safranal or crocetin are usually the result of various, often complex and unclear mechanisms. In most circumstances elevated levels of oxidative stress and reduced antioxidant defenses are evidenced. 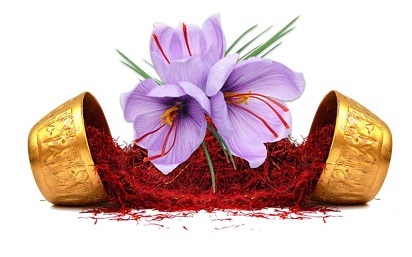 In the following paragraphs, certain pharmacological effects that have been demonstrated so far in vivo and attributed to the antioxidant activity of saffron and its constituents are presented. The pathogenesis of acute Central Nervous System (CNS) disorders (e.g. dementia, ischemia) is associated with oxidative stress effects. After brain injury, Reactive Oxygen Species (ROS) are overproduced resulting in imbalance of prooxidant/antioxidant species and damage of tissues via several different cellular molecular pathways. In principle, ROS are considered to play a major role in the formation of Nitric Oxide (NO) and Malondialdehyde (MDA) and to suppress the activity of antioxidant enzymes such as Superoxide Dismutase (SOD) and Glutathione Peroxidase (GSH). The exceeding oxidant species may, thus, impair key cellular components (lipids, proteins, and nucleic acids) leading to subsequent cell death (necrosis or apoptosis). Since 2005, when Safranal was found to protect hippocampal tissue of ischemic rats from oxidative damage, a number of preclinical experiments in animal models were carried out using saffron extract, isolated Crocins, Picrocrocin or Crocetin to study their effect on markers of cerebral ischemic-induced injuries. So far literature indicates that administration of saffron extracts at doses > 100 mg/kg b.w. (i.p. or p.o. ), trans-4-GG at > 25 mg/kg b.w. (i.p. ), safranal at > 700 mg/kg b.w. (i.p.) or crocetin at > 8 mg/kg b.w. (i.p.) is expected to be beneficial for the abovementioned pathological conditions. Saffron, Crocins and Safranal have also shown cognitive-enhancing effects in animal studies. Few clinical trials have been carried out so far and provide evidence that daily and chronic consumption of saffron extract capsules (standardized to 1.7 mg trans-4-GG/capsule) by patients suffering from Alzheimer disease is as much helpful as conventional treatments with less adverse effects. The underlying mechanism is still not known; in vitro studies have shown that crocins and to a lesser extent, safranal, are likely to inhibit the oxidationinduced formation of toxic amyloid fibrils which signal the onset of various degenerative diseases such as the Alzheimer one e.g. 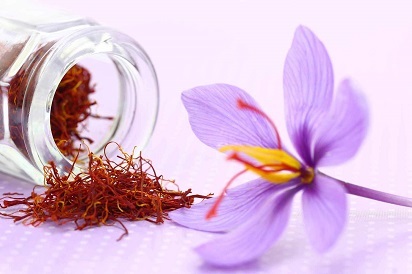 The anti-depressant effect of Saffron was evidenced by several clinical trials so far e.g. This type of action against inflammatory and immune responses, disruption of neurotransmitter balance and neurodegeneration may involve antioxidant, antiinflammatory, serotonergic, hypothalamus-pituitary-adrenal (HPA) axis-modulating and neuroprotective mechanisms. Crocetin and its trans-4-GG ester have shown a potential in the treatment of atherosclerosis, hyperlipidemia and other cardiovascular disorders. In particular, oral administration of these constituents to quails (25, 50, 100 mg/kg/day) for a period of 9 weeks was found to attenuate atherosclerosis mainly by decreasing the levels of oxidized LDL. Zheng et al. reached the same conclusion after feeding hyperlipidemic rabbits with Crocetin for 8 weeks. The latter research group reported also that the hypolipidemic effect of trans- 4-GG Crocetin can be attributed to the inhibition of pancreatic lipase activity, which mediates the hydrolysis of fat. In addition, orally administered trans-4-GG at 20 mg/kg was found to improve cardiac functions in rats fed with a cardiotoxic agent (isoprotenol) by maintaining the redox status of the cell, restoring endogenous antioxidants, controlling lipid peroxide formation and preserving activities of CK-MB, LDH enzymes. It is generally accepted that diabetes and its complication, that is, peripheral neuropathy and retinopathy are associated to oxidative stress. Although dietary supplementation of saffron may induce a short-term improvement in age-related macular degeneration, it is not clear yet whether the improvement of retinal function is due to antioxidant effects. It has been suggested though that supplementation of saffron extract or trans-4-GG may be beneficial against glucose-induced neurotoxicity in PC12 cells by inhibiting the formation of ROS. Recently, saffron, trans-4-GG and Safranal were found to prevent the formation of gastric lessions and lipid peroxidation products as well as the depletion of glutathione induced by indomethacin in nondiabetic and diabetic rats. The efficiency was comparable to that of a conventional medicine, omeprazole and attributed to the antioxidant action of the plant constituents. Saffron and its constituents, trans-4-GG, Crocetin and Safranal, are potent antioxidants. This is proved in several in vivo studies with animals in which, after dietary supplementation of the medicinal plant, the levels of antioxidant enzymes such as superoxide dismutase and catalase as well as reduced glutathione increase e.g. On the other hand, the content in lipid peroxidation products such as malondialdehyde, iso-prostaglandin, hippocampal nitrite levels, oxidized LDL, oxidized DNA decreases. In several cases, the saffron, trans-4-GG, Safranal or Crocetin-treated animal tissues (e.g. brain, liver, hippocampus) showed a positive response toward the Ferric Reducing Antioxidant Power (FRAP) assay indicating elevated levels of reducing substances. Despite the numerous studies that demonstrate the aforementioned effects, the exact mechanism of action is still unknown. In fact, saffron extracts or free Crocetin are not expected to act like the phenolic-type antioxidants that is, by direct scavenging of free radical species in cell-free models such as those employed in common antiradical activity assays (e.g. DPPH, TEAC). The strong activity of Saffron constituents in comparison to that of known phenolics is revealed only intracellularly; Crocins seem to have an intracellular antioxidant effect comparable to that of a-tocopherol and Crocetin is more powerful than curcumin and rosmarinic acid in the protection of insulin- stimulated human monocytes. Thus, the most probable pathway is the interaction of Crocins and Crocetin (through the conjugated double bond system) with antioxidant enzymes or with signal transduction of free radicals in the cells. For example, they could inhibit generation of H2O2, which acts as a signal transduction messenger to activate transcription factors NFB (Nuclear Factor Kappa B) and AP-1 (Activator Protein 1) for gene expression of various inflammatory cytokines and proteases that cause cell damage. Safranal, as a lipophilic monoterpene aldehyde could also act as inhibitor of ROS through a pathway that remains to be elucidated. The pharmacologically active compounds present in saffron seem to deliver their potency synergistically which highlights the benefits of dietary supplementation of the spice rather than isolated constituents. Extracts rich in Crocins or isolated Crocetin are prone to autoxidation and photoxidation due to extensive conjugation. Their shelf life can be prolonged via encapsulation e.g. as it is also reported for other bioactive ingredients. Last but not least, it is necessary to emphasize that all the biological functions that are ascribed to saffron can be claimed only if the plant material used is authentic and of high quality. Peculiar adverse effects that have been reported e.g. mortality after ingestion of 4 g/day is rather associated with the use of fake saffron. Schmidt et al. suggested that many such cases that are reported from Germany, refer to “meadow Saffron” (Colchicum autumnale), which is a poisonous plant and relatively abundant there. Other mislabeled products such as “American saffron” that corresponds to Carthamus tinctorius L. (safflower) petals and “African saffron”, which is actually the flowers of Lyperia crocea should be avoided. Since saffron is particularly susceptible to fraudulent practices it may contain other parts of the flower of Crocus sativus L., or the flowers of other crocus species or other plants (e.g. Calendula officinalis L., marigold) with or without coloring properties. The ground rhizomes of Curcuma longa (turmeric) are often mislabeled as saffron powder. Saffron of low quality or non-colored exogenous matter used as substitute can be also adulterated with synthetic dyes. The development of modern high throughput analytical methods for detecting adulteration in saffron is a primary objective of the research network established through the COST Action FA 1101 with the acronym Saffron-OMICS. The importance of this program lies on the involvement of scientists from countries in Europe and elsewhere (e.g. Egypt, New Zealand) with great interest in acquiring expertise in the cultivation and production of high quality saffron. The efforts of this network is to offer to the scientific community and stakeholders advanced tools for combating saffron fraud with lower quality plant materials (Gardenia jasminoides Ellis, Buddleja officinalis Maxim, etc) and other types of adulterants. Introduction of the use of authentic saffron in everyday diet seems to exert beneficial health effects so that the spice can be considered as a functional food ingredient.